Stickles dry, ultra fine glitterwill add a sparkle to all your craft projects, adhere to craft surfaces with any type of adhesive. 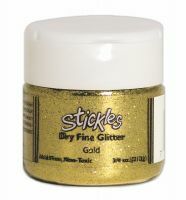 This ultra fine glitter is particularly useful for small or intricate areas. Gold glitter creates a beautiful golden lustre, acid free it is perfect for all types of papercraft projects. It comes in a ¾oz or 21.2g shaker pot. Also available in diamond and silver.